Should we mail you a cat, perhaps? I'm sure it would get through customs. oooh, I'm with you on the mice. I have heard stories of them running across people's bare feet and I shudder in fear. Something about the little buggers!! I hope you can stay clear of them! 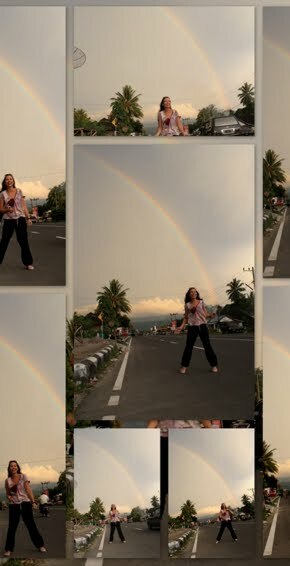 I am looking at the pictures with the rainbow and I am thinking that you must be really cool. Who wants a mouse chewing on her toe? Oh the topic, mice rats, and other creepy crawly things hate steel wool -- it cuts their mouth which leaves them as prey,,, not to be desriptive of inflicting pain on one of God's creature, the little ones know enough to stay away -- its the one thing they can't build up an immunity and eat around or avoid.... works better then a cat who can only get one -- either that or get a snake they say 'king' snakes get the whole nest. Thanks all, for your sympathies. To those of you who suggest a cat... we have had a stray visit our compound several times in the last few weeks. We're trying to figure out how to get it to stay: feed it enough to stick around but not so much that it doesn't have a huge appetite for the little guys! If all goes well, I'll have that last most important protection in place! !